This agenda item starts at 22:57 in the video above. Wirral Council’s Pensions Committee who manage the Merseyside Pension Fund received a report recommending that they write off £1,033,550.67 in rent arrears. The reasons as to why £1,033,550.67 of rent arrears needed to be written off were in a report of CBRE (the managing agents for the Merseyside Pension Fund’s properties) that councillors agreed to keep secret. Video of what was said about the rent arrears starts here and continues here. Here is a transcript of that item. Cllr Pat Glasman (Chair, Pensions Committee): Right, agenda item 11 (property arrears). Paddy Dowdall (Investment Manager): Thank you Chair, firstly apologies for not being able to spell property and further apologies for the purpose of the report which is to write off the not insignificant £1,033,550.67 in unrecoverable rent arrears from the property portfolio. There’s an exempt appendix as per schedules that are available. The local government act, I can’t comment on parts relating to the exempt appendix. Cllr Harry Smith (Labour, Pensions Committee): I think it’s worth commenting that 5% represents £5 in every hundred, that’s a lot of money to write off, but you know I don’t think it’s unnecessary that we do it, I’ve nothing against the recommendations, £5 in every hundred. Cllr Pat Glasman (Chair, Pensions Committee): It’s very disappointing. Cllr Mike Hornby (Conservative, Pensions Committee): I think Chair that CBRE should be made aware of the concerns expressed by this committee. Cllr Pat Glasman (Chair, Pensions Committee): Could you make sure that that is minuted? OK.
Cllr John Fulham (Labour (representing St. Helens Council), Pensions Committee): I’m going to discuss it in exempt, is that alright? Cllr Pat Glasman (Chair, Pensions Committee): We are. Those on the Pension Committee decided later in the meeting to exclude the press and public for discussion of the CBRE report into property arrears on grounds of commercial confidentiality. 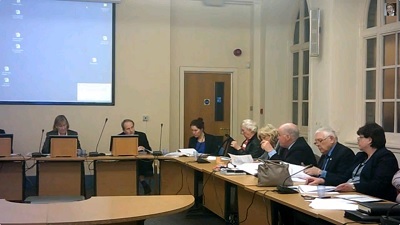 « Was the Wirral Council Cabinet decision to consult on closing Lyndale School lawful? So now our financially incompetent Council is losing money on behalf of pensioners! Councillor Smith needs a ‘good talking to’! Also CBRE need to be more closely monitored and I think a ‘spot’ audit wouldn’t go amiss! The Merseyside Pension Fund (which is administered by Wirral Council) has a value of ~£6 billion. Some of that is invested in property, from which the fund is supposed to get rental income of £20.1 million a year. CBRE are the managing agents for the Fund’s property portfolio and have responsibility for collecting rent and managing arrears. Each year they produce a report on uncollectable arrears (which is the appendix councillors decided to keep out of the public domain). It was based on this report that councillors decided to write off £1,033,550.67 in rent arrears as CBRE deemed them to be “irrecoverable”. See, if it involves over £million, then councillors get so annoyed they “minute their concerns”. I’d hate to think what they’d do when they get really angry! John it beggars belief a million pound plus written off’, its a disgrace what with million pound payoffs to “Disgraced ” officers £850,00.00 for a fire escape at the town hall, £750.000.00 paid back to disabled who had been fleeced over years, One million pound in councillors allowances, £65,00.00 in compromise agreements, Parking running at a loss the list is endless. My blood boils whenever I see what these idiots who are supposed to run the council they deserve to be sacked or better still surcharged then perhaps they would be more careful with our, repeat our money. The legislation covering surcharging of councillors and officers was repealed in 2000. What a pity john so they can do what they like with impunity what a shame!!!!. Well not exactly, there are rules they’re supposed to abide by. Politicians have to get the public’s support every 4 years and have their political party to keep them in check the rest of the time. Senior officers are subject to all kinds of rules and can be made subject to discliplinary procedures as employees.